Originally published in Ingenuity (Fall/Winter 2000), pp. 12-13. Thanks to UBC’s Faculty of Applied Science for permission to reprint this article. The “good old days” of engineering may not be so old after all. As the Faculty of Applied Science (Engineering) gets set to mark its 85th year this fall, we may discover that our new and improved future looks an awful lot like our celebrated past. In the last few years, we have made great improvements to our undergraduate programs. We created a double degree program in Arts and Engineering, added more hands-on learning opportunities through co-op, the Project Integration Program (PIP) and first-year case studies, and launched a Minor in Commerce and a new Integrated Engineering program to provide students with more exposure to business, communication and the humanities. The changes are new, exciting, and, dare we say, revolutionary! And yet, they are also somewhat familiar…. In the fall of 1915, the Faculty of Applied Science became one of the founding Faculties at UBC. To earn a degree in Applied Science, students had to complete five years of study. It involved a common first-year in Arts, then a common first-year in Applied Science, followed by three years of specialized study in Chemistry, Chemical Engineering, Civil Engineering and Surveying, or Mining. In the summer months, second-year students were assigned a reading list, which included five novels collectively described as “Everyman’s Library.” It included classics such Dicken’s David Copperfield and students had to write an exam on the books prior to the start of the fall session. The intent was to round out their science-based curriculum with ongoing exposure to the Humanities. Interestingly, in 1915, students had the option to do a double degree in Arts and Engineering. The format was much the same as our new program, with students spending their first three years in Arts (and taking a handful of Applied Science courses such as Hydrostatics, Mechanical Drawing and Shop-Work), and then focussing exclusively on engineering courses for the remaining three years. Other similarities exist in the emphasis on practical experience and lab work. Today we encourage students to participate in co-op education and to pursue hands-on design opportunities such as those available through the Project Integration Program (PIP). In 1918, the UBC Calendar stated that all students entering third-year engineering were required to prepare a 2000-word essay, consisting of a critical description of mandatory summer work relating to their field of study. All essays were filed for reference in the Engineering Departments and students were encouraged to submit duplicate copies to the Canadian Society for Civil Engineering or the Canadian Mining Institute for prizes. On the note of prizes, the first reference to a private scholarship specific to Applied Science appears in the 1919-20 calendar. The Dunsmuir Scholarship, valued at $165 and founded by the Hon. James Dunsmuir, was awarded to Mining Engineering undergraduate Clayton Leslie Aylard. At the time, tuition was $17 per year. 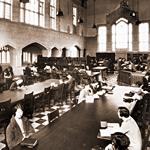 By 1925, registration in Applied Science had grown to 192 undergraduates and four graduate students pursuing MASc degrees. The number of third and fourth year specializations had grown as well. In addition to the 1915 offerings, students could pursue degrees focussed on Forestry, Geology and Geography, and Mechanical and Electrical Engineering (the latter being one program at the time). Most departments had one to two professors, one associate professor and a lecturer or an assistant to round out the faculty. Jumping ahead to 1965, when the Faculty was celebrating its fiftieth year, the UBC Calendar shows that most of the present day departments and programs were in place, in one form or another, including one extra department for Agricultural Engineering. At that time, the total faculty count was 91 and annual tuition had increased to $551 per year. In the 1965 Totem yearbook, Dean David Myers emphasized the important role that the Faculty was playing in fulfilling a “a very great need in the growing economy of BC.” He foresaw that as the province moved away from primary products, engineers would become increasingly valuable for their ability to develop new industries and create new job opportunities. He expected the trend of engineers leaving BC in pursuit of greater employment opportunities in Ontario and the United States would reverse. It’s interesting to note that we are facing the same issue today, despite the growing maturity of the BC economy. On a lighter note, Dean Myers also referred to something else that has not changed-and that’s the engineers’ reputation for “esprit de corps.” He believed that the work of the Engineering Undergraduate Society (EUS), which included “dunking people in pools, stranding them on library roofs and singing risqué songs” was, within limits, “very good for producing a better sense of social responsibility and togetherness”! It goes without saying that as far as creative pranks and having fun, the engineers of recent years haven’t changed much. Even today, engineering students continue to play a major part in adding colour — RED! — to life on campus. Hopefully, the same may be said of the Faculty itself, with its enduring ability to forge friendships, fond memories, and lifelong success.